Rio Ferdinand believes Manchester United manager Jose Mourinho has finally found a way to get the best out of big-money signing Paul Pogba. Pobga has been given more freedom by Mourinho in recent weeks. 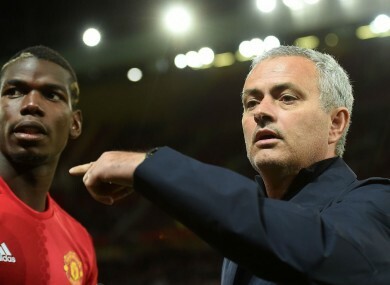 FORMER MANCHESTER UNTIED defender Rio Ferdinand feels Jose Mourinho has finally found a formation to get the best out of Paul Pogba. The France international initially struggled to live up to the high expectations at Old Trafford following his world record move from Juventus, but he has thrived in recent weeks as United have gone 10 games unbeaten. Ferdinand believes Mourinho’s decision to field Michael Carrick and Ander Herrera in support of Pogba has been key to United’s resurgence. “I do not think Jose knew his best team for a while but in the last few games you have seen him consistently starting the three midfielders of Herrera, Carrick and Pogba,” Ferdinand told the official United website. “I think you have seen a better balance in the midfield, so hopefully we can start motoring on now. “That has been a problem in the past in terms of working out where the balance is and who the best partnerships and combinations are, and I think he may have found that in those three. Email “Mourinho has finally found Pogba solution - Ferdinand”. Feedback on “Mourinho has finally found Pogba solution - Ferdinand”.